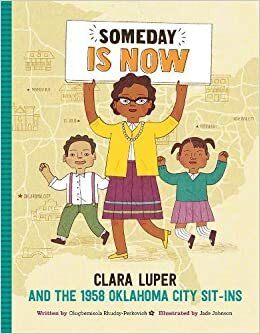 Summary: When Clara Luper was growing up in Oklahoma in the 1930’s, her father promised to take her to segregated parks and restaurants “someday” when it was legal for them to go there. Clara grew up to be a teacher, and decided that “someday is now”. She wrote a play called “Brother President”, and her students were invited by the NAACP to perform it in New York. There, they experienced the freedom to go wherever they wanted, and to eat in restaurants with white people. Back in Oklahoma, they studied Martin Luther King Jr.’s four steps to nonviolent change: investigation, negotiation, education, and demonstration. They used these steps to try to desegregate the lunch counter at Katz restaurant. When the first three steps failed, they demonstrated by sitting at the counter and demanding to be served. Day after day, they braved being spit on, having food thrown on them, and hateful phone calls to their homes. Finally, Katz agreed to desegregate the lunch counters, not only in Oklahoma, but in Missouri, Kansas, and Iowa. Clara and her students enjoyed a meal together, then moved on to their next challenge. 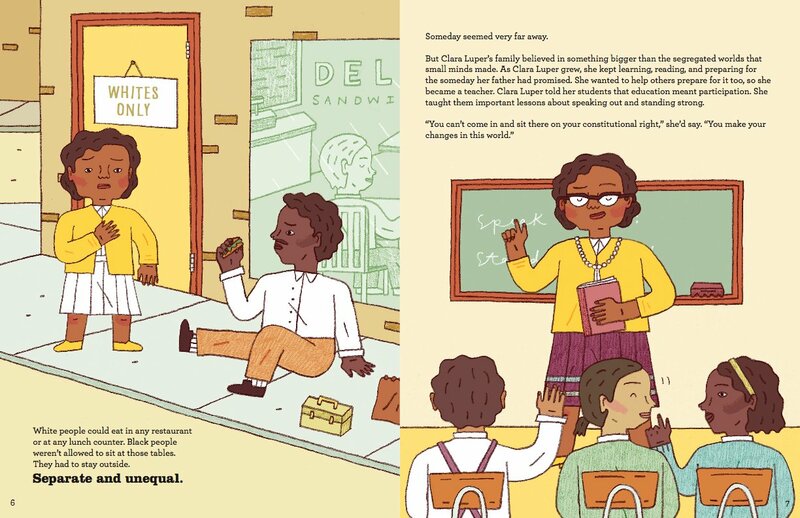 Includes additional information about Clara Luper and nonviolent resistance and a glossary. 32 pages; grades 2-5. Pros: An interesting and little-known chapter in the Civil Rights Movement. Clara Luper and her students used sit-ins to desegregate lunch counters two years before the more famous protests at the Woolworth’s in Greensboro, NC. The folk art-style illustrations are a good complement to the story, and the back matter provides important additional information. Cons: A few more dates included in the text or a timeline at the end would have helped place the story in historical context. Next > Dragons In a Bag by Zetta Elliott, illustrated by Geneva B.